Rush Street Gaming [RSG] got a lot of free public relations puffery on the front page of yesterday’s Sunday Gazette. 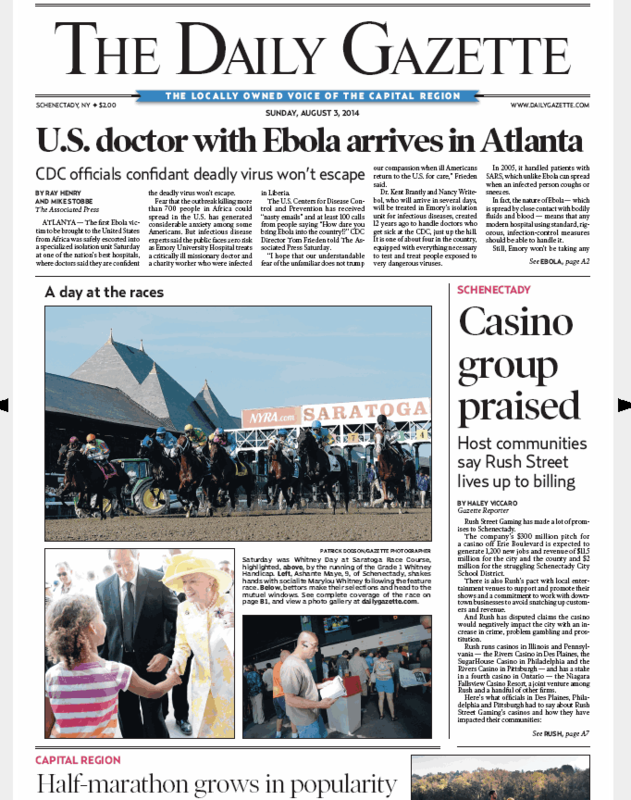 See “Schenectady Casino Group Praised“, August 3, 2014, by Haley Viccaro; subscription required to view online) Haley’s article is filled with quotes from local development and business officials and Rush Street Gaming’s CEO Greg Carlin, without a word from their detractors, such as Casino-Free Philadelphia, or the Worchester MA citizens group that was successful in keeping RSG out of their city, nor even from the Stop the Schenectady Casino group. Perhaps the article is the Gazette‘s penance and mea culpa to Casino proponents for an earlier article titled “Officials in other cities warn of pitfalls, failed promises by Rush Street“? (June 8, 2014, by Bethany Bump). Rather than let all the lily-gilding go unanswered, I left a lengthy, red-eye Comment at the Gazette website around 1 A.M. Sunday, which I am reproducing here, minus typos, plus minor supplementation and citations. It sounds as if the Gazette has only talked to casino boosters — Chamber of Commerce, Economic Development staffers, and the like — who sound like Schenectady’s development professionals, with not a bad word to be said about any development. What do casino opponents and advocates for the poor say? Here are a few things your readers should know about SugarHouse in Philadelphia. (2) RSG’s CEO Carlin brags that the folks at SugarHouse encourage their customers to stay at surrounding hotels. Of course it does: SugarHouse has no hotel of its own and must help customers find suitable lodging nearby. (3) As to crime near SugarHouse, Alan Greenberger, Philadephia’s Deputy Mayor for Economic Development, is quoted saying “The immediate area actually got safer now that the casino is here.” and the article states that “Rush has disputed claims the casino would negatively impact the city with an increase in crime.” RSG forgets to mention (as does the Gazette) that Philadelphia PD has created a 14-man unit that solely patrols a one-half mile radius from the casino (which does not include the rear of the casino, because it is on a river). A patrol that size would cost over $1 million annually in total compensation in Schenectady. The special casino unit in Philadelphia surely accounts for all or most of any drop in crime. Unfortunately, however, there has been “displacement” and the area just past that half-mile radius (analogous to our Stockade neighborhood and Union College’s College Park area) has seen very large increases in vehicle theft and vehicle break-ins. For discussion of the recent study of crime near SugarHouse since its opening in 2010, which describes the dedicated police patrol and crime displacement to close neighborhoods, see our posting “did crime go up around the SugarHouse casino?”. (4) At SugarHouse, RSG has specifically targeted young gamblers by creating a less-complicated form of craps, called “Props & Hops.” [see “Sugarhouse Develops a New, Simplified Craps Game For Younger Players“, CBS6, May 2, 1014; SugarHouse Props & Hops Brochure] It has also recently added a large number of poker tables. They plan to have 12 poker tables in Schenectady, at a casino only a block from a major undergraduate Union College dorm, and a few blocks from Union’s campus of poker fanatics. We can surely expect a lot of promotions aimed at Union students who are 21 years old or about to be. What other claims has Rush Street Gaming been making that have no basis in fact? Find more about Schenectady’s casino at stoptheschenectadycasino.com [now known as Snowmen at the Gates. I know Haley Vicarro is a good investigative reporter. Let’s hope her bosses let her do a sequel to Sunday’s puff-piece on Rush Street Gaming that doesn’t sound like it was penned by RSG’s public relations department. follow-up (Aug. 14, 2014): How do customers of one of RSG’s urban casinos feel about their experiences? Take a look at Google Customer Reviews of SugarHouse Casino in Philadelphia (see Google’s column on the right side of the page). This entry was posted in punditry/viewpoint, Schenectady Casino, uncategorized by David Giacalone. Bookmark the permalink.